Schizophrenia is a chronic disorder that has an adverse effect on the lifestyle of an individual. Schizophrenic patients interpret reality in an abnormal manner. The disorder results in various behavioral changes that include grouping of hallucinations, delusions, etc. Schizophrenia treatment is a lifelong procedure. The medication used for treating schizophrenia controls the behavior of patients. These medications control the dopamine in the brain, and hence the overall behavior of the schizophrenic patient. Antipsychotics are used to control and manage schizophrenia disorders. Usually, second generation antipsychotic medications are prescribed as they have reduced side effects as compared to first generation antipsychotic medications. Apart from medications, schizophrenia is also treated using therapies such as individual therapy, social skill therapy and other therapies that enhance lifestyle of schizophrenic patients. In the research report on global schizophrenic treatment market, various therapies and their respective market scenario across various regions is covered. The research report also entails various trends, drivers, challenges and opportunities are discussed. According to this research report, the global schizophrenic treatment market is projected to expand at a robust rate in the coming years. According to World Health Organization, in 2013, approximately 50 million people in the globe were suffering from schizophrenia. Even though the rate of schizophrenia is reducing, the treatment rate and prescription rate for this disorder is increasing, consequently creating potential growth opportunities for schizophrenia treatment. The diagnosis rate of schizophrenia has also increased since past several years, owing to increasing footfall of patients. Post the introduction of the first atypical antipsychotic treatment for schizophrenia in 1970, the rate of treatment seeking has considerably increased owing to less side effects of atypical psychotic medications. 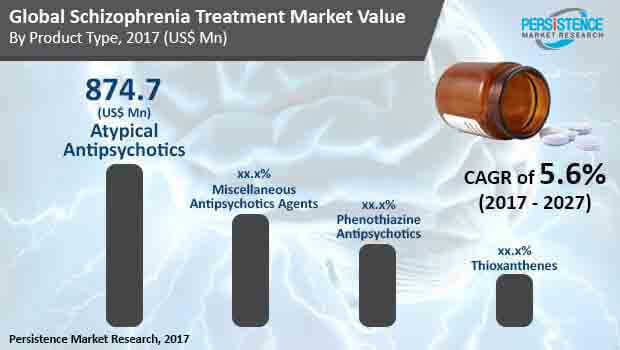 Several players involved in schizophrenia treatment market are concentrating on building commercialization and research alliances with a view to exploit prospects. For instance, in 2014, Vanda Pharmaceuticals entered into a sub licensed agreement with Novartis that ultimately resulted into global licensing from Novartis related to fanapt. In 2016, Astella collaborated with Astra Zeneca in order obtain exclusive rights from Astra Zeneca to manufacture quetiapine fumarate. The synergy generated through collaborations and partnerships is creating a positive and immediate growth impact as compared to mergers and acquisitions. In addition, manufacturers of schizophrenia medications are focusing on grasping new opportunities for revenue generation. To achieve this, manufacturers are targeting emerging markets for potential growth opportunities. There are several medications for schizophrenia. Of these, atypical antipsychotic treatment, a second generation antipsychotic medication, is highly used owing to comparatively less side effects and high effectiveness of the medication. The atypical antipsychotics segment in the product type category is projected to expand at a high rate during the forecast period to reach a valuation more than US$ 1 Bn by the end of the period of assessment (2027). Miscellaneous antipsychotic agents are also gaining high traction. This category includes various agents, to name a few, lithium, pimozide, molindone, haloperidol and loxapine are used to treat schizophrenia. Of these, haloperidol and lithium are the most referred choice of physicians due to their higher effectiveness and comparatively low pricing. The miscellaneous antipsychotic agents segment is projected to expand at a value CAGR of 6.1% throughout the period of assessment.